I can't wait, this is the future. Bring it on! 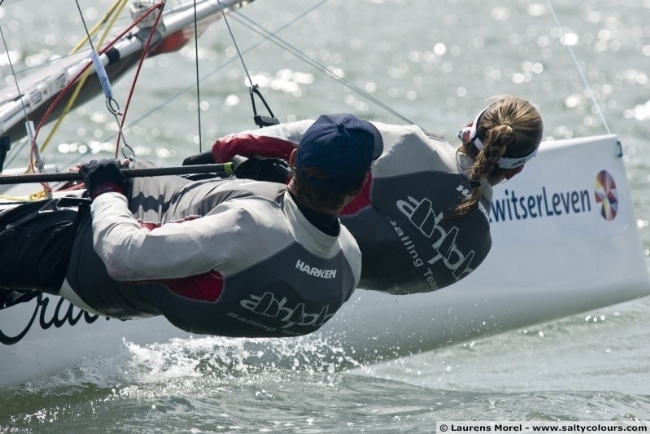 The showdown between the two fastest sailing boats in the southern hemisphere has been and gone. Good news is Australia is the winner on line but the Kiwis have us on handicap, this was due to us taking a rating hit and carrying the code zero (which we never used). The racing was fantastic and I cannot wait till we get to do it again. We had a small hipcup on the second last day with a reef and our centreboard while tring to miss two whales and 3 yachts in a small channel that made us DNF in the second last race and miss the last one which was a shame. Both skippers are now keen to get out and practice some match racing skills for those pre starts. 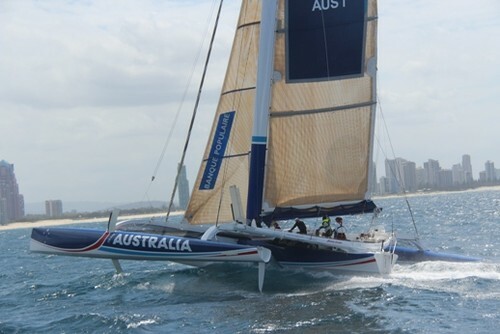 A lot of lessons were learnt while racing and what changes could be made to make the boat even faster again, so now we just need a nice big sponsor to come along and put there name on the fastest sailing billboard in Australia. Must say a big Thank you to Sean for the ride and a thank you to Simon and Team Vodafone boys for coming over and racing with us. 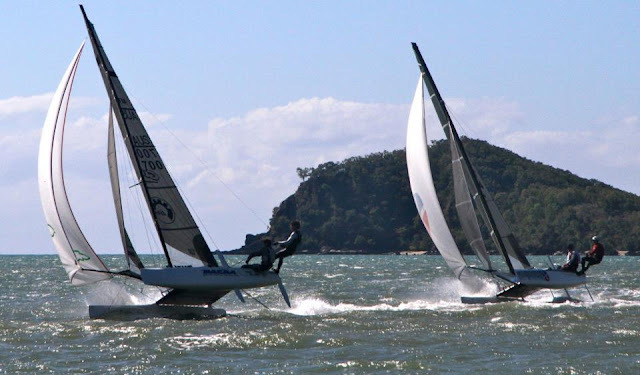 The show down for the two fastest sailing boats in the southern hemisphere is set to take off next week at Audi Hamilton Island Race Week. From NZ we have Simon Hulls 'Team Vodafone' and from Australia Sean Langmans 'Team Australia'. 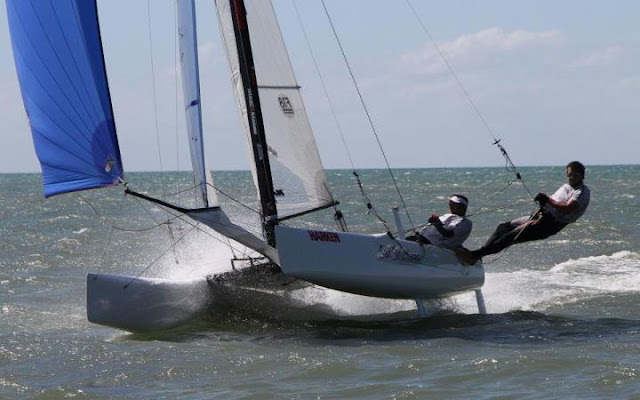 Both boats are French built ORMA 60's, and they use to race each other on the grand prix circuit in France for years but both boats now live down south and are very keen to get together as much as possible to race. It is going to be a spectacular sight seeing these two race and all going well I will bring some great onboard footage to the web for you guys (and girls) to see. All I can say is aussie aussie aussie oi oi oi. 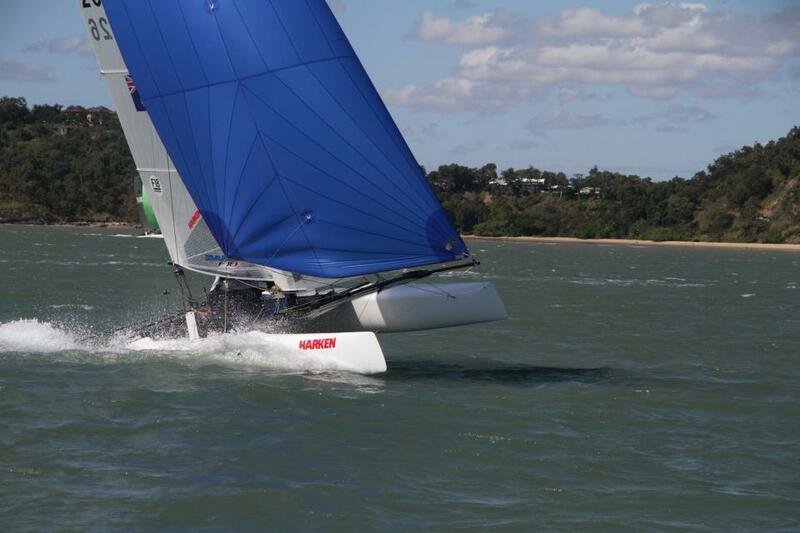 Nacra NQ sailor Mal Richardson with his Nacra 36C. 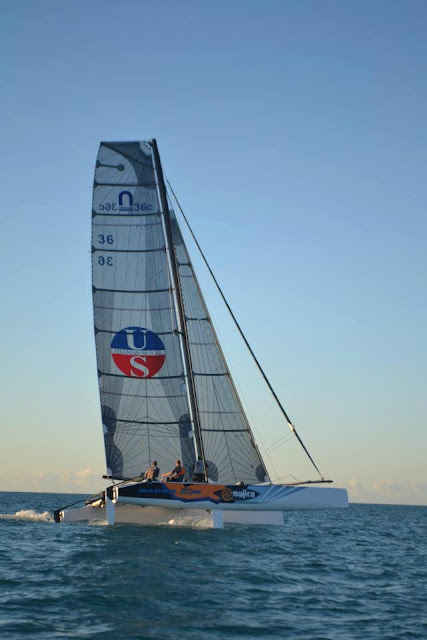 The boys are in final tuning stages with the new rig and sails before Airlie Beach Race Week. We wish them all the best for the regatta, and we will be following their progress through out the regatta. Here's a great video of the boys out training. Ellis Beach Regatta: Cairns (report from the NACRA NQ boys) thanks boys. A mixed fleet of 35 boats including 9 F18s attended this years regatta hosted by Cairns Yacht Club at their beautiful Ellis Beach site. Saturday saw a 4 lap morning race followed by a Marathon in the afternoon, with 5 short course races planned for Sunday. A nice 15-18 knot SE breeze greeted competitors on Saturday for the first race. T.H.R. 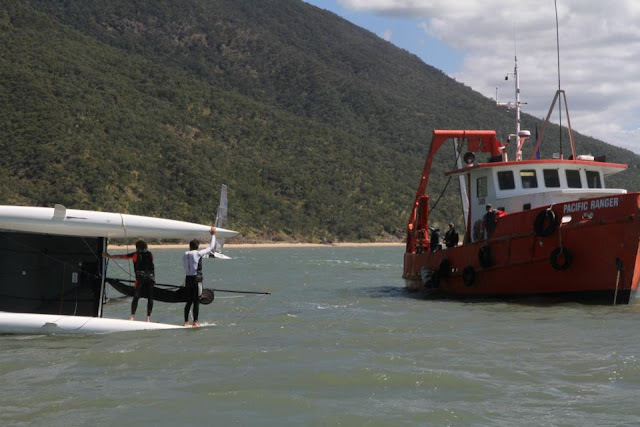 members Mick & Viv were late for the start after noticing a rudder bolt failure whilst leaving the beach. 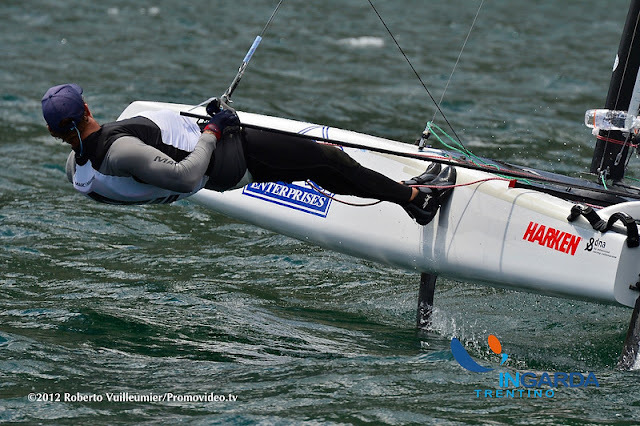 Dale Mitchell on "Ullman Sails" led from start to finish ahead of Jamie Leitner, with Mark Leitner in 3rd. The breeze gradually built to 20knots for the afternoons marathon which saw sailors start just off Ellis Beach, work up to Yorkeys Knob, run down around Double Island, work back up to Trinity Beach and then a final run back to Ellis Beach. After breaking the start Mick & Viv quickly fought back to be right behind Jarrod Cook and Luke McMullen early in the work. Jarrod encountered gear failure half way to Yorkeys and was forced to retire leaving Mick and Luke to fight it out to be first to turn. Luke turned only a matter of seconds ahead of Mick, only to be rolled during the hoist with a great set by Viv. The rest of the fleet was around 2-3 mins behind at the first mark. After carrying kites for around 5 minutes the lead boats dropped kites and starting coming up to the layline to get around Double Island. This angle suited Mick & Viv and they created a nice 2-3 minute gap ahead of Luke as they approached the island. The rest of the fleet carried kites much longer and this created a very slow and akward angle back up to the rum line. After rounding the Island, Mick and Viv noticed Luke heading towards the mark down at Ellis and after a quick "discussion" of the course they realised Luke was going to the wrong mark and this was welcomed by the trailing pack of Jamie Leitner, Sneaky McNally and Mark Leitner. Mick and Viv were now well clear of the next boats and enjoyed the beautiful conditions on the work up to Trinity Beach before turning for home with a awesome 20 knot SE behind them and surfing 1-2m swells. Sunday saw another stunning day, with water temp of around 20 deg, temp of around 25 deg and a nice 15 knot SE blowing. 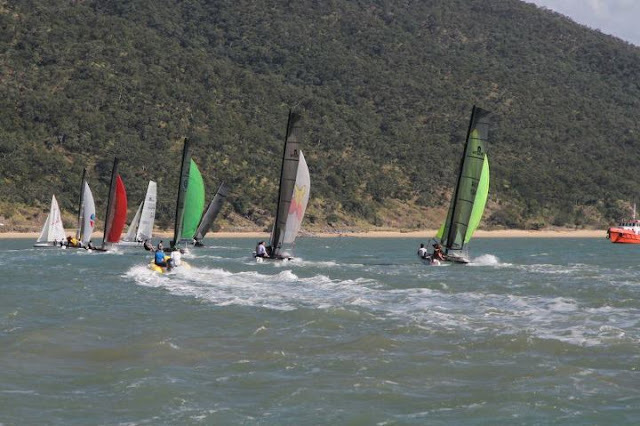 This is winter sailing in North Queensland!! 5 short course Windward Leeward courses were run, and the start boat did a great job of getting each race underway very quickly. Dale awoke from his slumber (after catching a case of Gastro on Saturday) and was back on the water, and fought hard in every race. Dale and Mick swapped race wins in the first 2 heats with Jamie right behind with two 3rds. Mick won the next 2 heats with Luke and Dale sharing the minor placings. Dale fought back to win the final heat ahead of Mick & Viv who were only a boat length ahead of Jamie in 3rd. 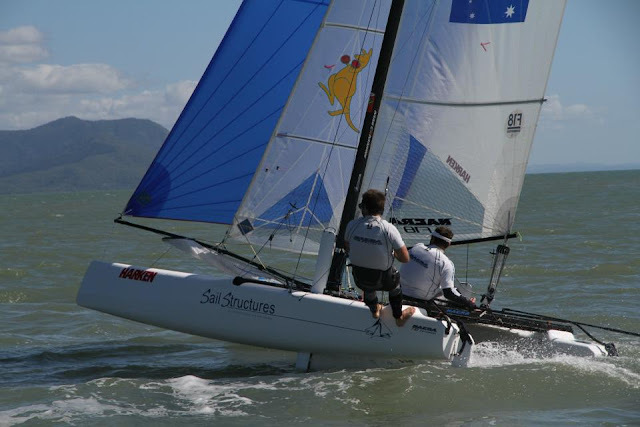 Dale had Mal Richardson crewing and Mal is now focusing on his Nacra 36C which will debut with its new rig and sails at Airlie Beach Race Week. Jamie has spent the last few years competing in Europe as a crew and now as a skipper is really putting the pressure on the top bunch! This format was great practice for the entire fleet with lots of shifts creating lots of passing lanes over a relatively short course. A big mention to the local Opti sailors, with one 7yr old sailor being the only Opti completing the Opti Marathon in 20 knots on Saturday. This was great to see! Thanks to the regatta sponsors and all the volunteers who made this a wonderful weekend. Cant wait for next year! 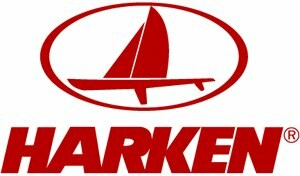 Team Harken Racing sailor Jack Benson has been over in Europe racing for the last few months. He has been to a few regatta's on different boats getting some good results. Jack is a very talented sailor and you will see his name coming up more and more in results if he keeps going the way he is. Hoping to get a full run down of the regattas he has done and what he has coming up soon but at the moment he is too busy racing so need to let him get on with the job at hand. I know he was a little disapointed with his result a Garda but he know's where he went wrong and what is needed to fix it. 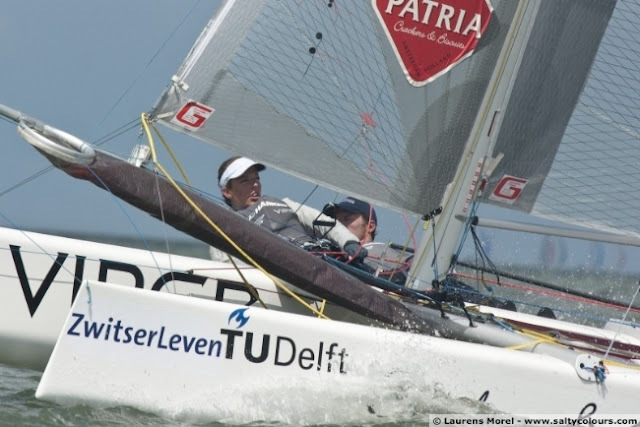 He has also been racing F18's (C2) and Vipers, sailing with Dutch girl Celine Van Dooren with some very good results. Good luck to you Jack on the rest of your European tour.